Creamy Poblano Potatoes Recipe - Learn how to do make it today. No meat in this Creamy Roasted Poblano Potatoes dish! I’m just saying this because I know some of you are sometimes looking for a meatless meal. You can enjoy this as a side dish or in tacos (at home we make this into tacos with charred corn tortillas). This Roasted & Creamy Poblano Potato dish is inspired by my time living in the City of Toluca, Estado de Mexico. That was about 30 years ago, and I’ve been making this meal ever since (either with roasted poblano or manzano peppers). I know, 30 years is a long time, but it doesn’t feel like it was that long ago when we lived there and used to go to the edges of the Toluca Volcano for picnics with friends! My friend Laura used to live across the hall from me in our apartment building and used to make this dish using manzano peppers. They are a little spicy, but the addition of the cream mellows the heat and balances out the flavors. Since these types of peppers cannot be found in every city, I sometimes substitute them with roasted poblano peppers, like in today’s recipe for Potatoes Poblanos Tacos. 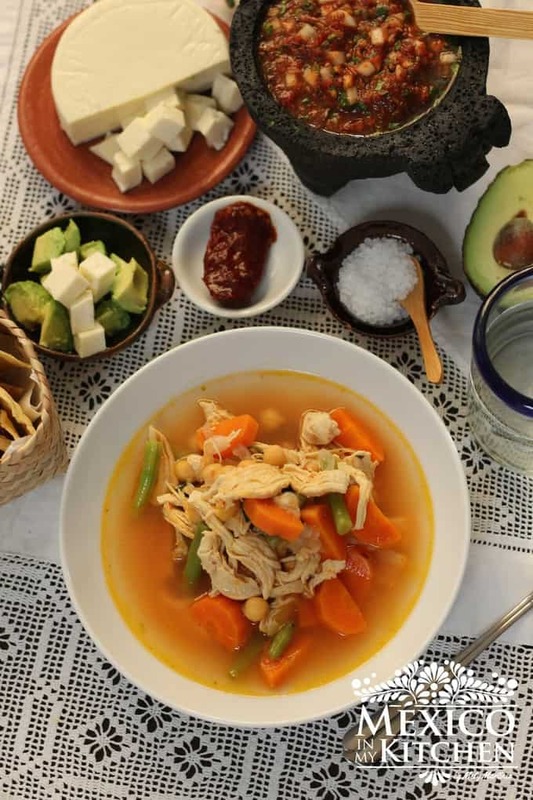 During our time in Toluca, we used to go up to the edges of the volcano for picnics, and every family would bring a cazuela (clay pot) with a dish. These would include dishes like potatoes with chorizo, chicharrón in salsa, refried beans, chicken tinga, and, of course, these creamy poblano potatoes dish also known as “rajas con papas recipe” or Poblano potatoes dish. The men would light the fire and everyone would place their pot on the grill to warm up the food, including the corn tortillas. Everyone shared their dishes. I’m sure people are still having this type of picnics in Mexico today! Now, let’s go to the recipe! While you are cooking the potatoes, roast the peppers, either in an oven or over an open flame or under a broiler. If using the broiler method, turn the setting to high and place the peppers on an aluminum covered baking sheet, then roast for about 3-4 minutes. Remove the peppers from the heat, cover with the aluminum foil, and let them steam for 3 more minutes. Remove the skins, then make a slit from the top to the bottom of the pepper and remove the seeds and veins. Cut the peppers into strips. Heat vegetable oil in a large skillet over a medium-high heat. Add the onion and cook until transparent. Add the drained potatoes and keep cooking for 3 more minutes, then stir in the pepper strips, and pour in the cream. Keep cooking for 2-3 minutes, just to warm up the peppers and cream. Season with salt and pepper. Enjoy these yummy Roasted & creamy poblano potatoes with warm corn tortillas! 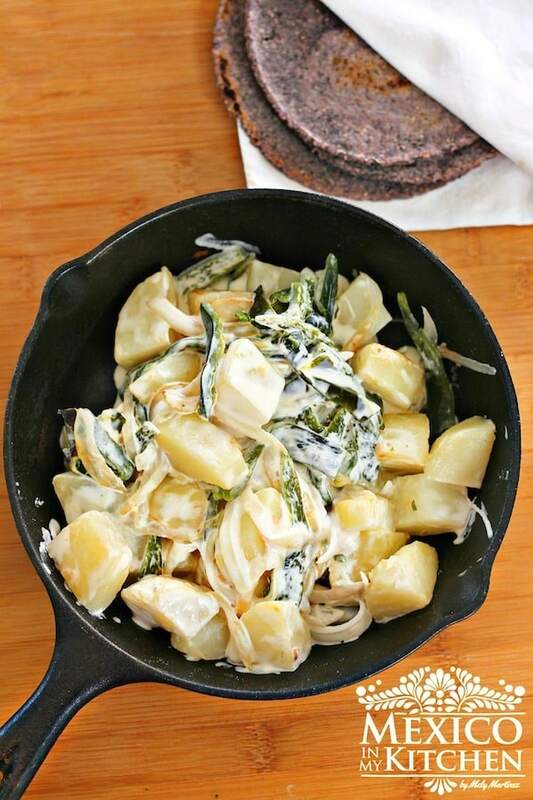 No meat in this Creamy Poblano Potatoes dish! I’m just saying this because I know some of you are sometimes looking for a meatless meal. You can enjoy this as a side dish or in tacos (at home we make the tacos with charred corn tortillas). Place the peeled and diced potatoes in a medium saucepan and cover with water. Cook at medium heat until they are cooked but still firm (about 15 minutes). Make sure to check from time to time, in order to not overcook the potatoes. Once done, drain the water and set aside. While you are cooking the potatoes, roast the peppers, either in an oven or over an open flame (if you have a gas stove) or under a broiler (if you have an electric stove). If using the broiler method, turn the setting to high and place the peppers on an aluminum covered baking sheet, then roast for about 3-4 minutes, making sure to turn the peppers to have an even roasting. Heat vegetable oil in a large skillet over a medium-high heat. Add the onion and cook until transparent (or, if you’re like me until they start becoming golden around the edges, this gives them more flavor). Add the drained potatoes and keep cooking for 3 more minutes, then stir in the pepper strips, and pour in the cream. Keep cooking for 2-3 minutes, just to warm up the peppers and cream. Season with salt and pepper. 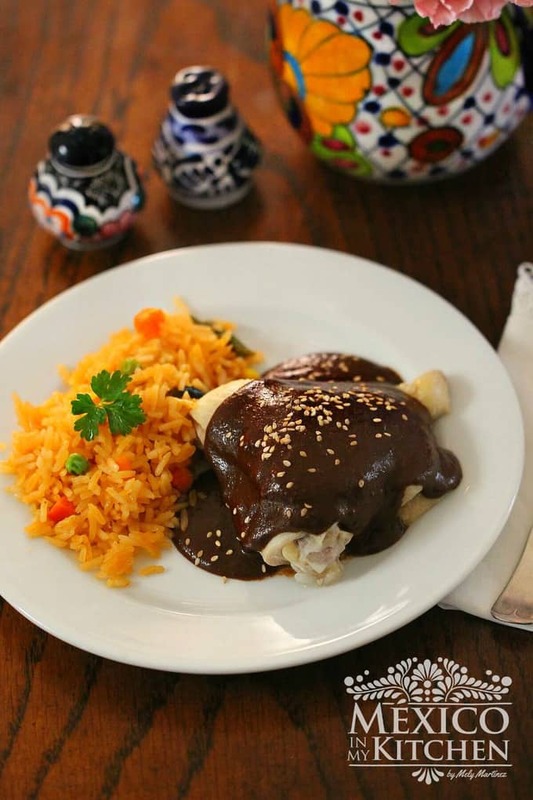 Enjoy with warm corn tortillas! 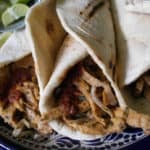 For recipes in Spanish, visit our site México en mi Cocina. Well, since I saw this at about 7am, I knew exactly what to do. I already had all the ingredients, even the Crema Mexicana! WOOT! I cooked as described with the only change being I cooked the onion until near caramelizing (Golden), then added the potatoes. Cooked until the onions where caramelizing, and the potatoes where starting to as well. Flavor! Finished as described, put some in a bowl and topped with a fried egg, runny yoke, of course! Garnished with chopped Cilantro. BREAKFAST! YUM! Thank you Mely! I added a bit of chicken stock and butter, heated, and added Chorizo. Eh? More cilantro, of course. I’m going to have to try this recipe. So far from the recipes I’ve tried I have no complaints. Thank you Mely for sharing these wonderful recipes! Your taqueria style salsa is my go to I practically have it memorized 🤗 Keep up the good work as well as giving me new dinner ideas as I usually rack my brain trying to figure something new to make lol.